Ever been in this situation? You’re feeling amazing about your fitness and health progress, and your girls want to go out for the night. You actually WANT to get dressed up to go out for once! You show up to the restaurant, feeling cute AF, and then you see the menu. All of it involves some form of rice, corn, bread — all the stuff you’ve been working hard to limit in favor of healthy grains and greens! WHAT SHOULD YOU EAT!? You start to panic. I’ve been there one million times. It is so hard to navigate a social life and pick the right meal at restaurants when you are trying to be healthy. So before you do anything else, take a deep breath. Remember that NO meal (no matter how many french fries) can totally undo your progress! You are making healthy choices to feel your best, not to be skinny. So pick the food that helps you do that, even at restaurants. Don’t worry – there are easy things you can do to make eating out painless! But I know it’s still hard. Recently, Ryan and I challenged each other to eat at popular chain restaurants for an entire day! We even made a vlog about it 😬😁I know that a lot of you don’t live close to really healthy dining options, so we tried to pick some of the most popular fast food spots. It was really hard, but it IS possible to make healthier choices, no matter what types of restaurants you have access to. 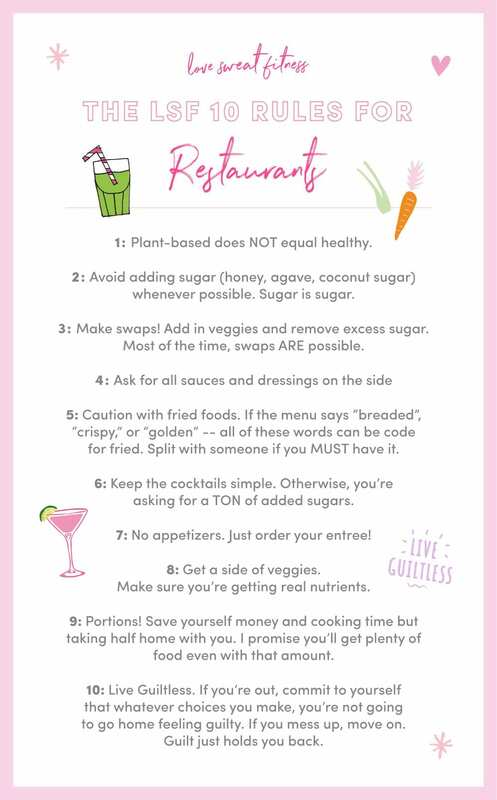 Print out this super cute printable guide to eating out and comment below with your fave tip!! All my best tricks are here, and I know they will help you, too!